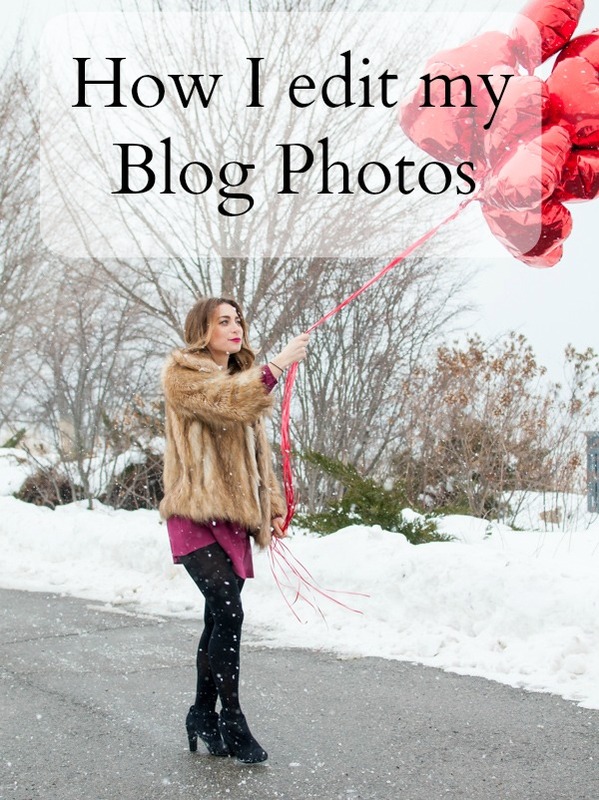 How I Edit My Blog Photos | La Petite Noob | A Toronto-Based Fashion and Lifestyle Blog. One of the tasks on my 30 Before 30 list was to take photos manually on an SLR camera and then edit them myself. I made this list as I was itching to get into blogging, so the concept of editing photos was so foreign to me. Knowing that I wanted to start my own blog, I was under the assumption that in order to do so one must have the best equipment - mainly an SLR camera, a MacBook and either Lightroom or Photoshop for editing photos. Brian already has an SLR camera, and I had just gotten my Mac so as soon as I downloaded Lightroom for myself I figured that I was ready to make my entrance into the blogging world! I've learned a lot since starting La Petite Noob and, while I appreciate all of my equipment, I've come to realize that it is certainly not required material to start blogging. Nowadays I find myself editing photos almost every other day and, while I'm not an expert, I've definitely developed a rhythm and practice that works best for me and my blog. I'm happy to share some of my best tips and tricks, resources and things I've learned along the way. I edit my blog photos using Lightroom and am not ashamed to say that I use a variety of presets to help get the job done. Why not? Presets are the gateway into editing professional looking blog photos, and there are so many to chose from that you're bound to find some that are suited to your taste. For example, when I first started blogging I preferred to use a matte, slightly vintage preset on all of my photos. I've since evolved past a heavily-filtered photo, and now use a series of work-flow presets that help me to quickly adjust the lighting, colour and sharpness to achieve a more clean and natural look. Some of my favourite Presets are from Pretty Presets and Bellevue Avenue. Keep an eye out for coupon codes, as both sites offer frequent discounts. If I'm every doing a hair tutorial, or need to place text onto a photo I will most often than not turn to a free photo-editing site to help to complete the task. Picmonkey is my absolute favourite site for manipulating photos after they've already been edited in Lightroom - and best of all, it's free! I would even go as far as to say that you could really use Picmonkey as your main blog photo editing tool as well. This editing system is incredibly powerful, and extremely user-friendly. I created the collage above using this free photo editing site. There is an option to upgrade to a paid membership that allows you access to more features, but in my opinion it is not necessary. There are so many talented bloggers out there that write wonderfully helpful posts on blog photography and editing photos. Some of my favourites that I like to keep on top of are the ladies at A Beautiful Mess, and my girl Dana with Wonderforest - these girls really know their stuff, and have a way of explaining blog photography and photo editing in a very relatable way. Check them out! I had mentioned this in my Tips for Instagram Photos post, but the same applies for blog photos - Utilize natural light and take your photos in it! Editing photos that have been taken in natural light is much more satisfying, as you get a much sharper result and have to manipulate the photo less to achieve great colours. Be careful to not shoot in direct sunlight through, then your photos are full of shadows and washed out - no amount of editing can overcome that and still look natural. Natural daylight in a spot where the sun doesn't hit directly is your best friend when shooting and editing blog photos. This is less of a photo-editing, more of a photo-taking tip but I swear that the quality of my photos increased tenfold after I stepped out of my comfort zone and starting photos in different locations - where people can potentially see you! The thought of someone seeing me as I took photos had previously terrified me, and it really held me back. Now I've lost all shame and ignore the sometimes confused looks from passerbys that I get. Different locations also make editing a lot more fun, and less tedious - a win! Editing blog photos seems like such a huge task to overcome at first, but once you find what works best for you it becomes second nature! What are your blog photo editing habits? I would love to know! Loved these tips- thanks, Joëlle! I still laugh when I see people stare at me taking pics in public- they must think I'm crazy! HAHA isn't it funny? I once told a puzzled observer that I was working on a "school project" and they seemed satisfied. The perks of looking like a child! I love this post! I have Lightroom as well, but I haven't taken nearly enough time to sit down and figure it out yet :(. It's on my to-do list! All I've managed to do so far is load my presets into it. I love the vintage, matte feel to your photos though! Have you checked out Pixlr as an online editor? I love it for collages and adding text to photos! I was the same way as well with Lightroom when I first started. I'm sure that I'm barely scratching the surface with my capabilities, but now I love it! I'm definitely going to check out Pixlr now! These are such wonderful tips and suggestions! Thanks Stacia, I'm so glad that you found them helpful! I always use photoshop... but I feel like I might have a better experience with Lightroom. I didn't know you could get presets, which I think is really cool. I have a lot of trouble getting a consistent theme. Thanks Emily! Photoshop use Actions, so definitely check them out - like Lightroom presets, but for that editing system! I definitely struggle with a theme too, it's an ongoing learning process! Great post! I definitely need to nail down a system for editing photos on my own blog! Thanks for the tips! Thanks Mindy, I'm glad that you enjoyed the post! You're tips are so awesome! I get so super shy taking pictures in public. Also, I love to use Canva and Pixlr to edit my photos. I don't have a super fancy camera but it seems to do alright.